Rescued with her mother, we never dreamed she would go first, but at 9 years old, cancer crept in and stole her away. We hear a siren and no howling, dinner is no longer an exciting time, and the squirrels are making their way back into the yard. In 6 years, she captured our hearts and even the grown kids who were a little jealous of our (dog), have shed their own tears. I am told dogs go to heaven and I hope that is true. I would love to see our girl again feeling better and back to her old loving self. We miss you Gina, and while other gsd's will come into our home, you will never be replaced. Kathy, I am so very sorry for your loss of your German Shepherd, Gina. Let me say right up front that I am so very sorry for your loss. It is so very hard to lose a wonderful German Shepherd at any time but your memories will help you through it all. Your memories will stick with you forever and help through your grieveing process. But thank you so much for sharing your story about your German Shepherd Dog, Gina, here with us all. And if you get the chance please leave some comments, we'd love to have you join in with us here and place a video of your own or tell us your own GSD story in our sharing section. 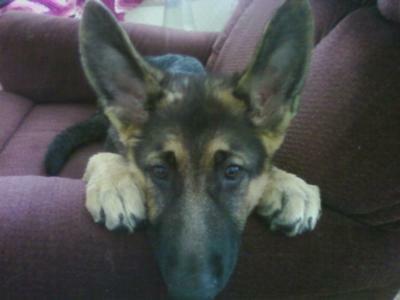 We'd also love to see your photos - after all the German Shepherd is one of the most beautiful canines on the planet! Thanks for your kindness.. German Shepherds are so noble and so captivating. I AM comforted by the knowledge that Gina is waiting... with the hope of being together again. In the meantime, I find a yearning for another GSD - a younger one perhaps, but those seniors without homes are also so drawing. I will honor Gina by increasing our family again... by helping those that have been dumped off - there are so many economic issues and so many that need homes. I am a rescuer at heart and will put aside my own fears of loss to help those who need me now! You helped me ... thank you. So sorry for your loss. She was so pretty. They sure do leave a hole in our hearts when they leave us. I do believe dogs go to Heaven and wait for us there. Right now, Gina is romping cancer-free in that beautiful meadow beyond the Rainbow Bridge, keeping a watchful eye on her Hu-Family. Previous to my Sibes, I had several GS and GS mixes. Wonderful pals. I know no words can ease your pain, but I do hope the fond memories of you have of her will help each day that passes. You have lots of canine friends out here! I appreciate your taking the time to write... We are slowly returning to "normal" life with our Mama GSD Jecko. We talk about another dog but can't do it yet... but one will come along and capture us.. that's just what they do... lol. Take heart, you can be assured your sweet Gina has indeed gone to heaven.